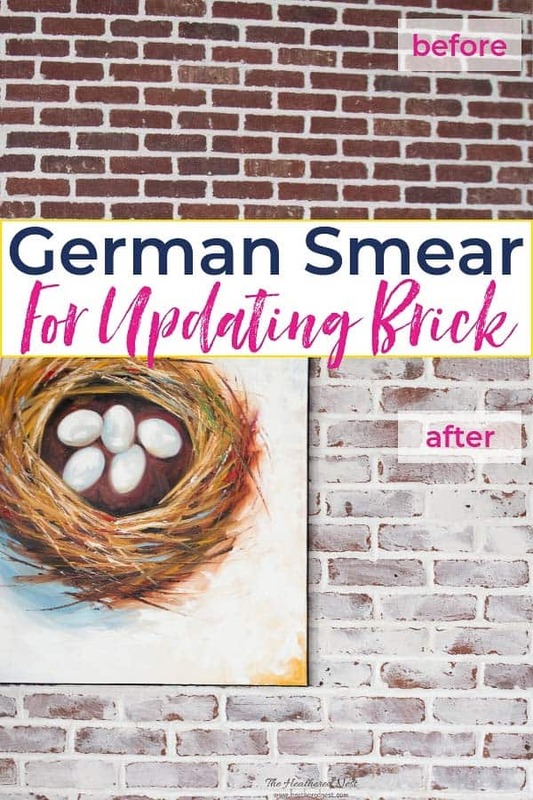 I want to show you how to do a DIY german smear technique to update brick. Have you ever heard the term, “German Smear,” or “German Schmear,” perhaps? What about “whitewashed brick,” “limewashed brick,” or “mortar washed” brick? If you have then you are likely in the same spot I’ve been in multiple times as a homeowner. 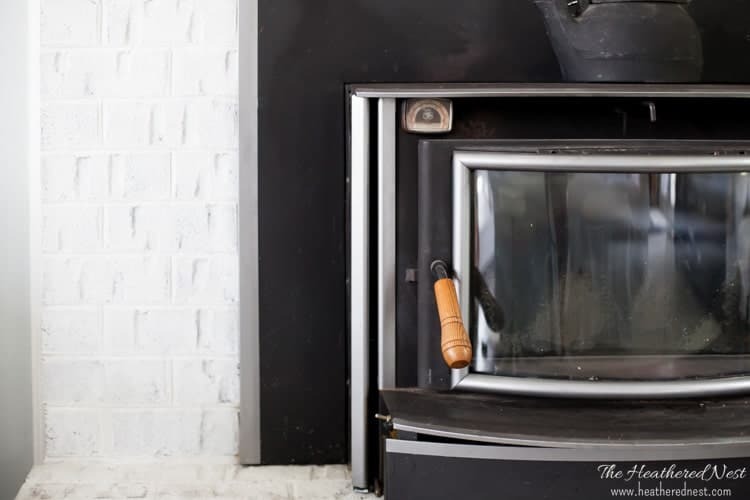 And that is staring at some outdated, maybe we could even go so far as to say ugly brick in your home and wondering how the heck you can update it without demolishing everything and starting fresh? If that sounds like you, then you’ve come to the right place. Because today, we’re going to explain and tackle a DIY German smear project to update brick. 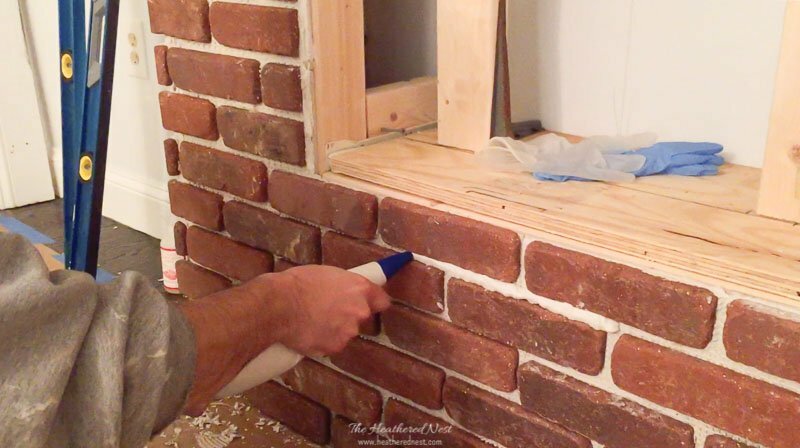 And we’ll explain a bit about the difference between this technique and others that are also frequently used for brick updates, as well. 1. I had NEVER heard the term “German smear” until like 2 weeks ago. 2. I don’t scare easily. I’m the small, scrappy type. Napoleon complex, small-woman-syndrome, call it what you will, but I don’t like things to get the better of me. Especially when it comes to a novel DIY project. After all, that’s what we do, right?! Right. But my Mama didn’t raise no liar, so I gotta tell you, I was NERVOUS to try this “German smear” or “mortar wash” whitewash brick project. But preparation is the key. So let’s make sure you understand where we’re headed. 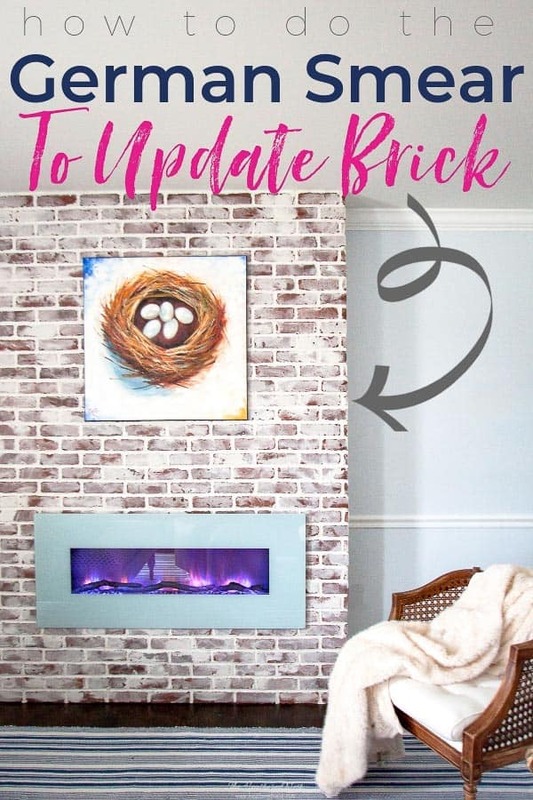 You’ll want to know the difference between this brick update technique and others. 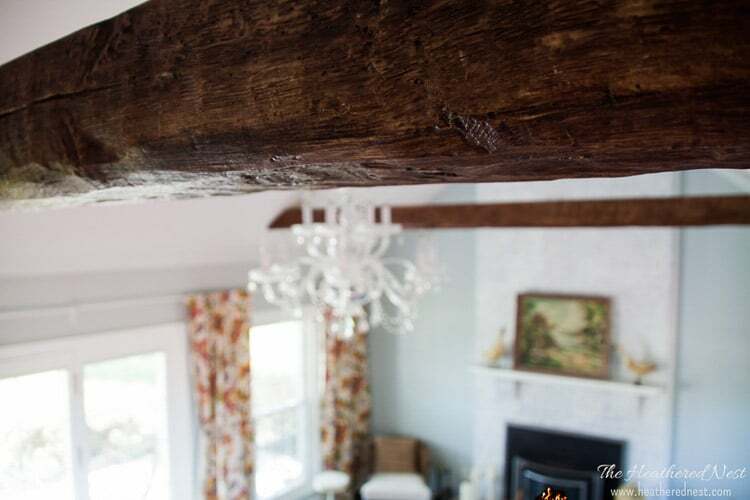 German Smear – using a white/light colored mortar to smear over brick and create a rustic, old-world European style finish. A German Smear does not completely cover your brick. Instead, you can control the coverage of the brick by using more or less mortar. German Schmear – same as above. Mortar Wash – yet another term for German Smear. Same process, different word (to make things as complicated as possible). 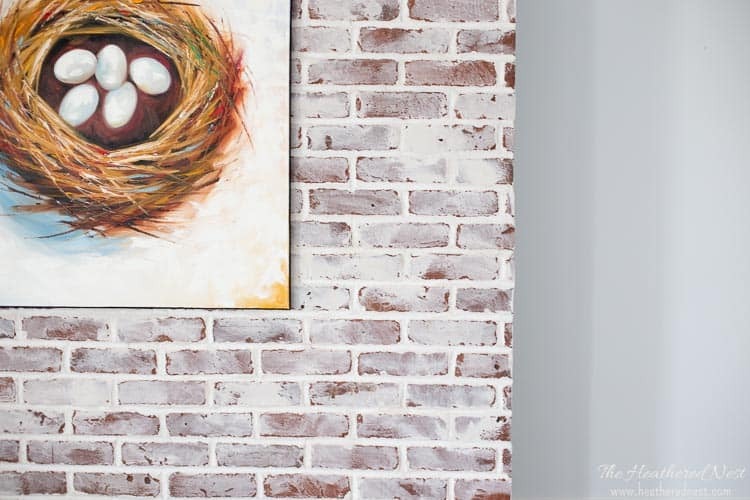 Whitewash – Painting your brick with a watered down latex paint. Depending on how much coverage you want on the brick, you can water down the paint more or less. 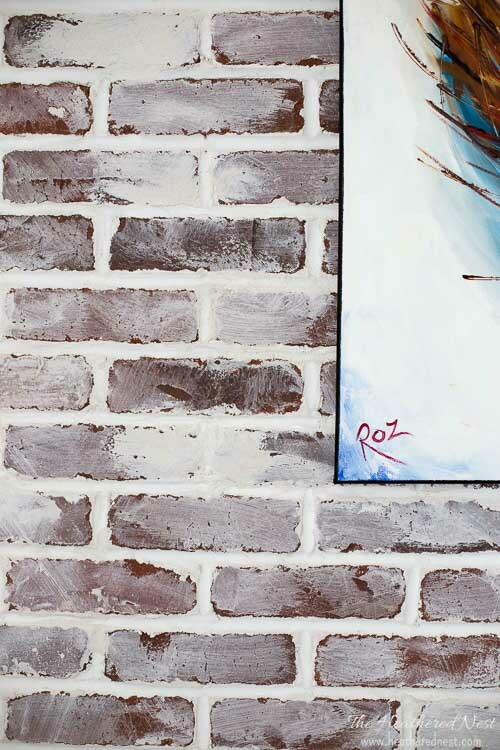 The more watered down the paint, the more of your original brick will show through. Limewash – A brick painting technique in which the brick is painted with a “limewash,” which is basically a special type of paint. Rather than latex, it’s made from slaked lime. The overall look of a lime wash is probably most similar to a whitewash. BUT a limewash allows you to preserve a bit of original brick coming through more so than with whitewashing. And, another nice feature is that apparently lime wash can be removed from the brick until about 5 days after its been applied…great if you change your mind! 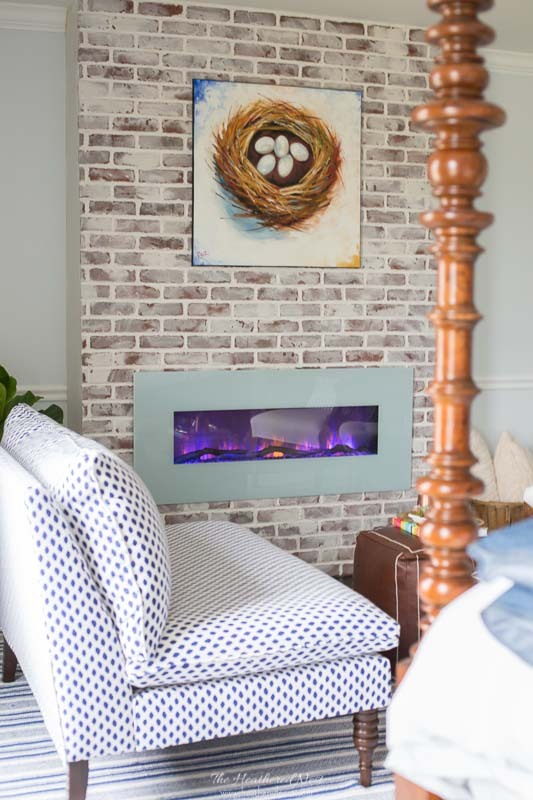 Painted Brick – Just like it sounds. 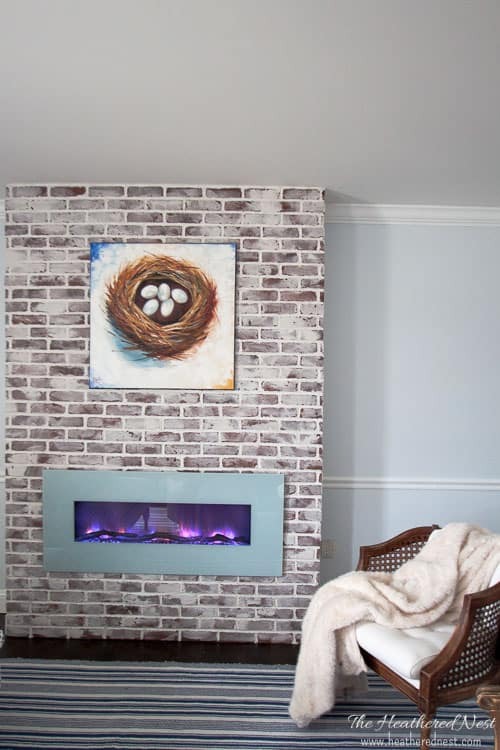 Painting brick with regular old latex paint is not only possible, but it can look great! This is basically identical to a whitewash except the paint is full strength/not watered down. 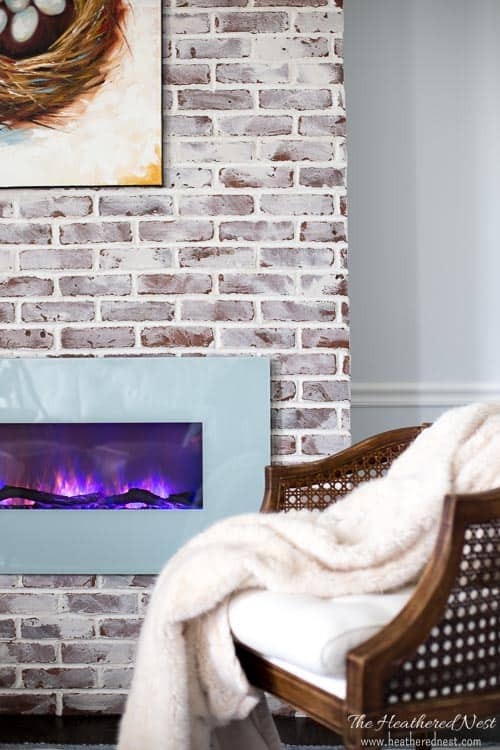 This is a great technique for FULL coverage of your outdated brick. 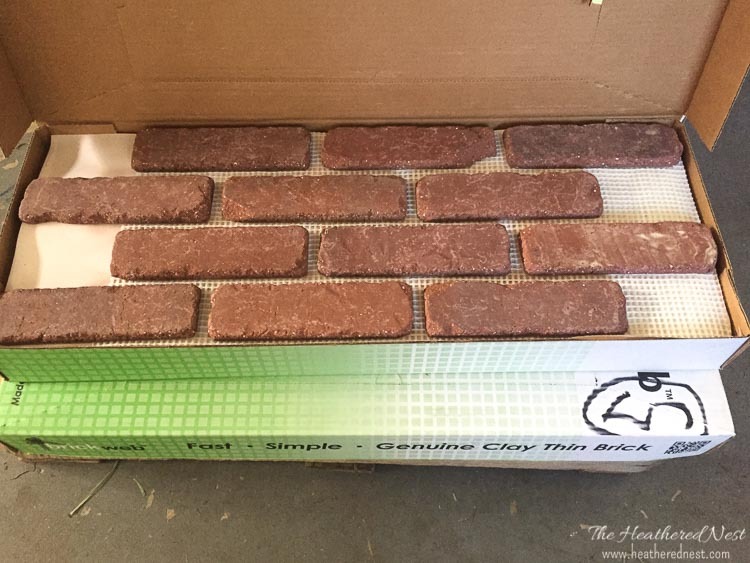 The brick (source HERE) we used (seen in the shot below), is real brick, but cut into thin slices. The slices are mounted on a tile webbing, similar to mosaic glass tile you’d use for a backsplash project or something. We had never used this kind of product before, and I gotta say, it’s great stuff. It’s REAL brick, so no phony looking brick wallpaper, or tile product that looks like brick but doesn’t feel like it. This is the real deal, only 20x lighter weight, and 20x easier to install than having to mount them brick by brick by %^$* brick. This is a project we are doing in our master bedroom. 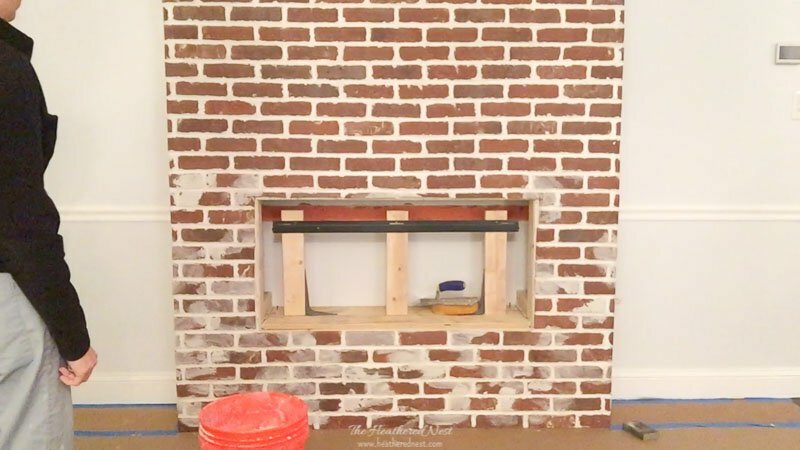 We framed out this fireplace wall and then mounted the brick. There was a whole wall of NOTHINGNESS there before. Dave and our brother Troy (of DIY Network’s “Nashville Flipped” fame), framed this thing up. Once the framing was done, Dave and I installed the brick. He cuts, I mortar those puppies in place. When it was done being installed and grouted (we used THIS sanded grout), this is what we had. That big hole in the front is where our little electric fireplace will go. I kinda loved it as is, to be honest. We hemmed and hawed about leaving it as is or moving forward with this German smear technique (also called a “mortar wash”). Truth is, I was SCARED to move forward. Having just spent $$ on brand new, totally fine as-is brick, I didn’t want to screw it up. 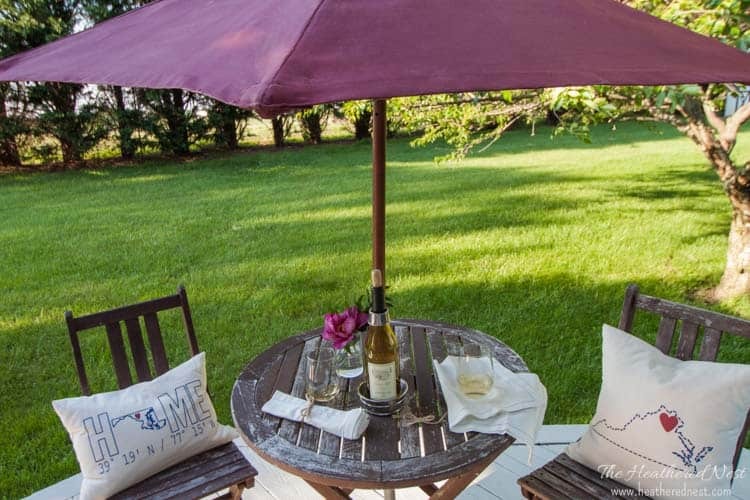 Oh, and before you start this DIY project, be sure to become an insider! Click the image below and have the German smear project guide sent to you immediately ⤵️! But we did (move forward, not screw up…although that is obviously completely up for debate being subjective and all ;). 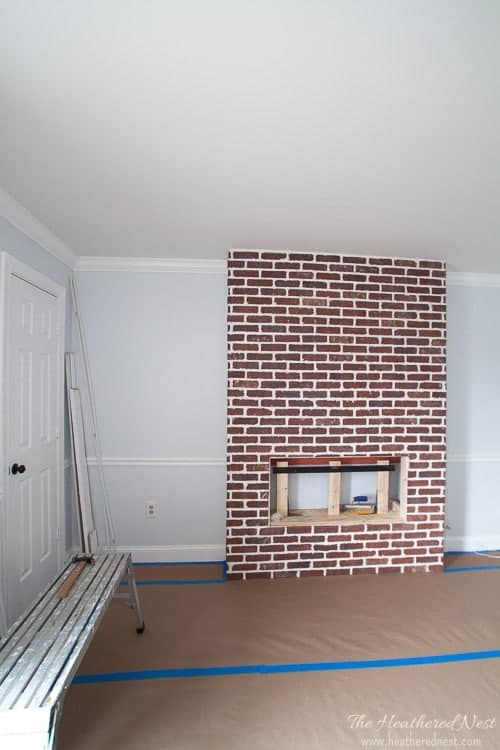 This DIY brick update took me about 2 hours, maybe a little less. If you want to try it, here’s how. 1. Before you begin…have a CLEAR picture in your head! 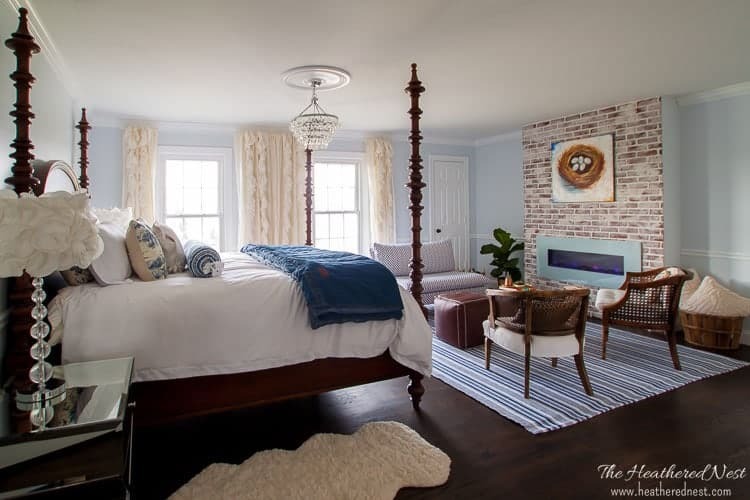 There are BUNCHES of different looks for painted brick, whitewashed brick, mortar washed or german smear brick. There are other techniques like limewashing. Scour Pinterest for a while, and pin a couple of your favorite looks. LOOOOVELY, no? I wanted a tad more brick showing through, and a little more choppy/uneven look. This version below is pretty picture perfect, I think. On a side note…check out that gorgeous slate roof and the patina on the downspout…makes my heart go pitter patter. And how about the one below? GORGEOUS, right? Yes, Kathleen is downright stunning, no question. But I feel she may be slightly upstaged in this shot by that delectable brick behind her. THAT is the look I wanted!! Before you proceed to the German smear, make sure you’ve ruled out whitewashing, limewashing or painting your brick. If you want to see more examples of what a mortar wash looks like, we did a post with 40+ German smear examples for you! 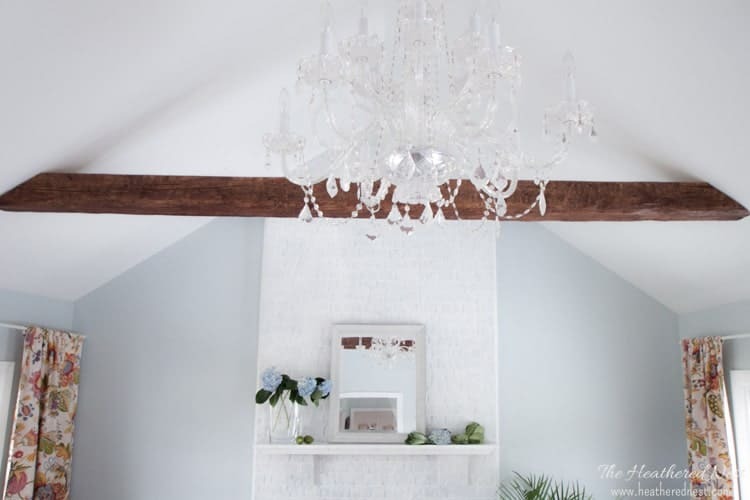 If you want to check out how a limewash looks, check out the limewash tutorial from my friend Lauren from Bless’er House wrote. 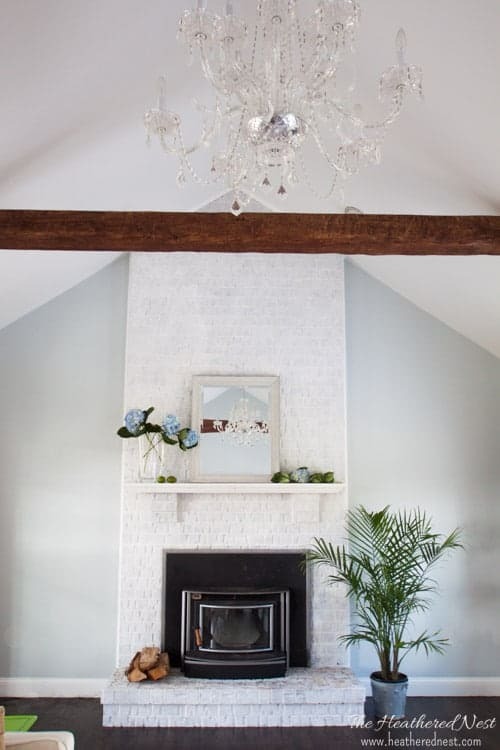 Take a closer look at our painted/whitewashed fireplace tutorial to rule out that technique. 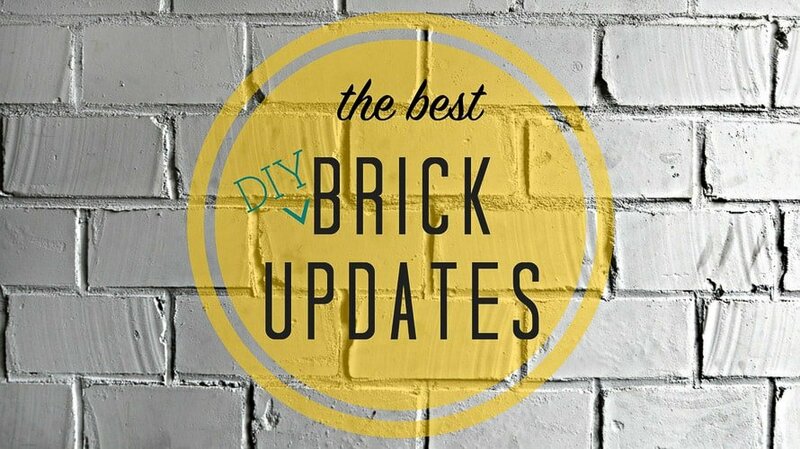 And if you’re still not completely smitten with any of these ideas, then look at these other brick update ideas. 2. 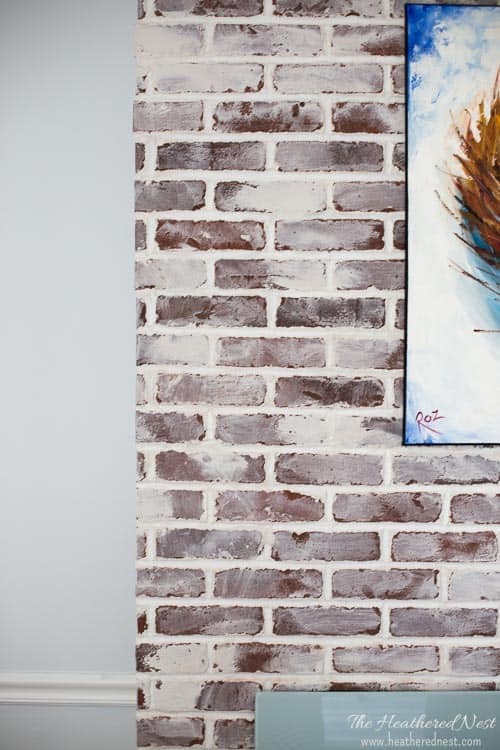 Start with clean brick with WHITE grout. 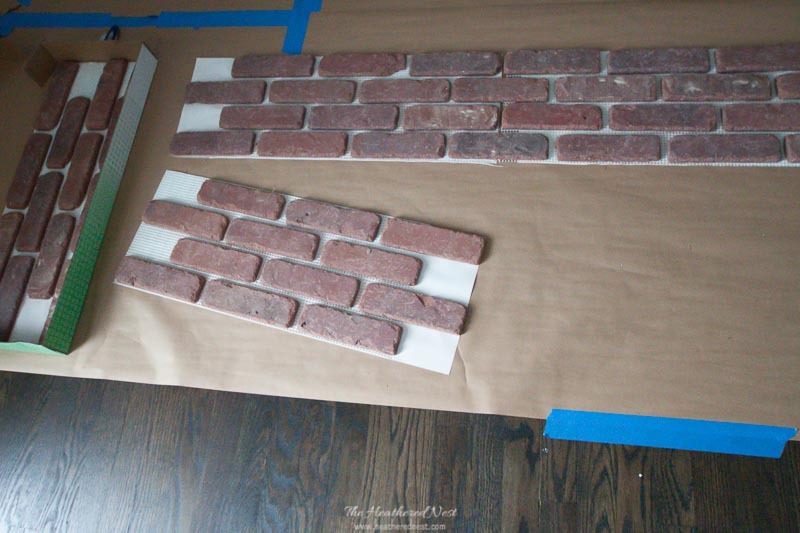 This tutorial assumes that you are starting with a slate similar to ours, which is clean bricks that have WHITE grout. If not white grout, then it needs to be a color you are HAPPY with. If not, then you need to do some prep work. And to be honest, I’ve looked around for tutorials on prepping old, we’ll call it “unattractive” brick, and the prep work looks like it can definitely be a wee bit grueling, quite honestly. Doing the German smear itself? Easy. It’s the prep you gotta consider. Jenna Sue (love her) YouTube tutorial – * note: her process took much longer than mine because she waited until the mortar had dried before removing as much as she wanted to. 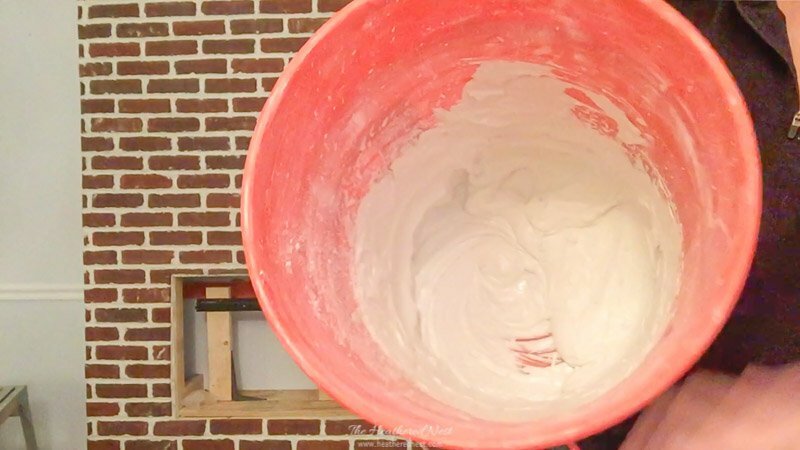 If you remove the mortar with a wet sponge before it dries, it is very, very quick and easy. Plus, NO SANDING at the end which avoids a time consuming, and very messy process. Get out the builder’s paper or tarps and cover your flooring if this is an interior project. We don’t want to mess up your floors while fixing up your walls. Following the directions on the package, mix your mortar. We started with a 7lb bag. 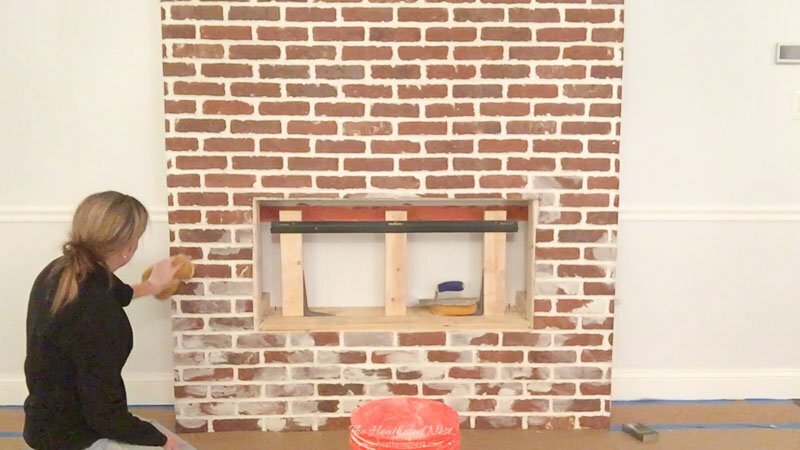 We have approximately 48 sq ft of brick on this fireplace wall. And for that much brick, we only ended up using approximately 1/3 of the bag. 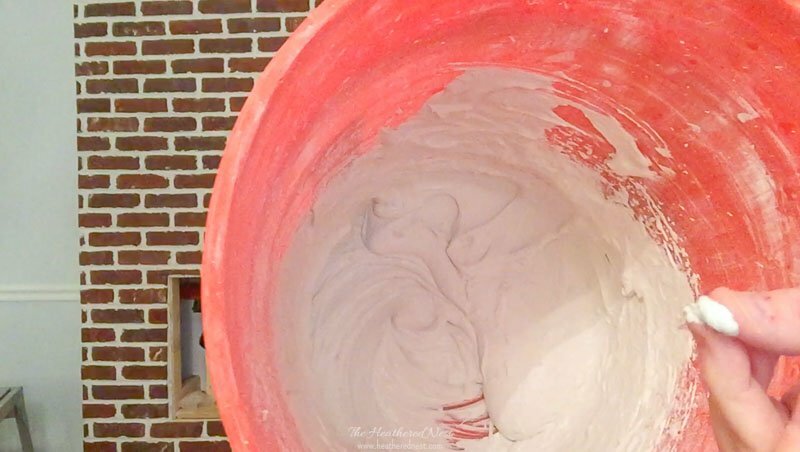 *If you are going to do the mixing in batches (we started by mixing 1/2 of the bag, and didn’t even need the rest), then make sure you are applying the mortar in RANDOM locations all around the wall, and NOT just in one quadrant or location of your brick wall. This will prevent a splotchy/uneven look if your later batch(es) of grout is not mixed to the exact same consistency as previous batches. Once your mortar is mixed, WATER IT DOWN just a tad. I’d describe the desired consistency to be that of honey. NOT as thick as peanut butter. Can you see it between my fingers? The white mortar is not so wet that it’s dripping off my hands, and not so dry that it’s crumbling or pilling. It’s somewhere in the middle…like honey. With your bucket or mortar ready, gloves on, and another bucket of water close by take your sponge and wet it with water. Not dripping wet, but wet enough that if you wanted to squeeze water out, you could easily. Now dip your sponge in the mortar and put enough mortar on the sponge that one corner is covered. Pick a spot, ANY spot, and smear. 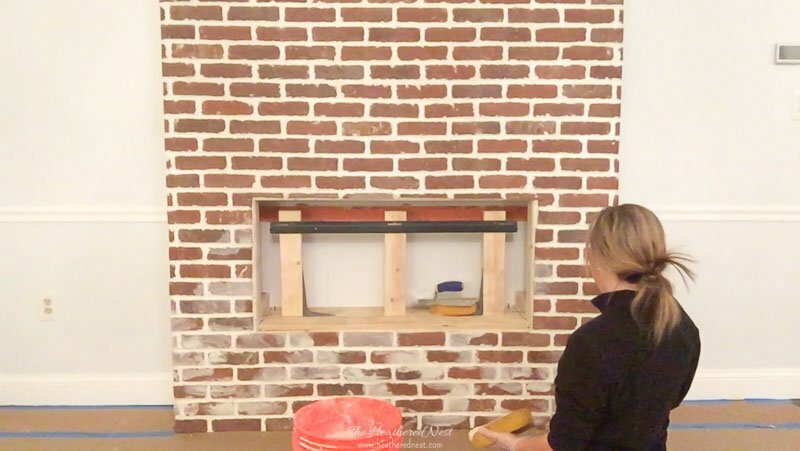 Beginning stage of the DIY german smear/mortar wash on our brick fireplace. I started at the bottom and worked upward. There’s no turning back now! Be random. Smear horizontally at times, vertically in others. Put it on heavy in places, and light in others. Frequently step back from your wall and check it out. Too heavy in spots? Then get some clean water on your sponge and wipe some off. Too light in others? Apply more. The look I was going for is a bit choppy. Not too even or refined. I wanted the brick color to come through here and there, and I wanted the brick in other areas to be white. 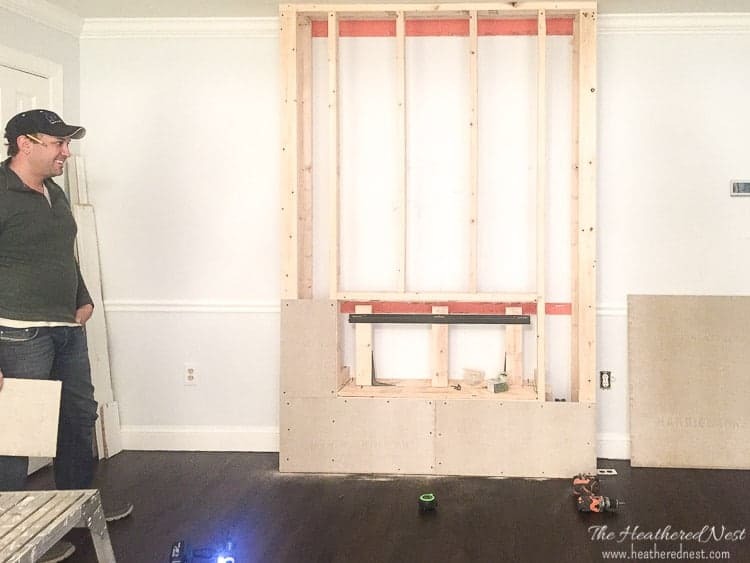 *Depending on the size of the wall or area you are covering, you will have time to adjust the application before it totally sets. The whole process for me took about 2 hours, and that WHOLE time, I could have easily wet my sponge with water and scrubbed off most, if not all of the mortar. So don’t freak out too much…you should be able to fix any “mistakes”. 6. 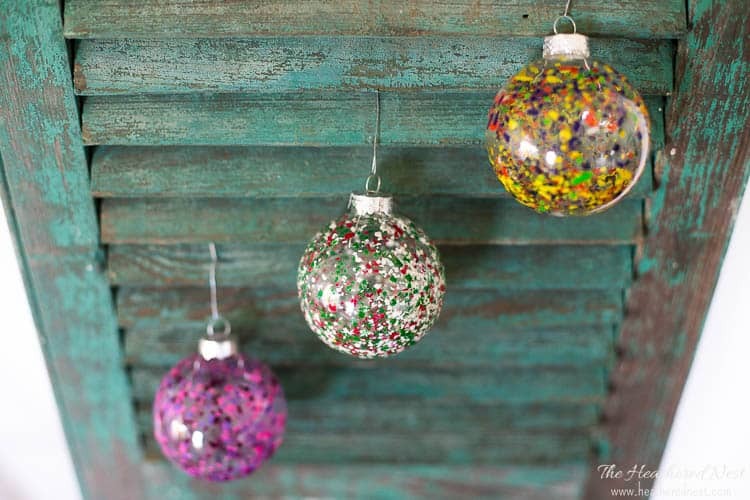 Knock any clumps down with a brush. I’d highly recommend looking over your whole wall/area before you start cleaning up and before the mortar dries and make sure you’re 100% satisfied with the look so that you don’t have to do ANYTHING to the wall once the mortar dries. Once it’s dry, if you start fussing with it, you’re going to have a LOT of nasty dust to deal with. YUCK. 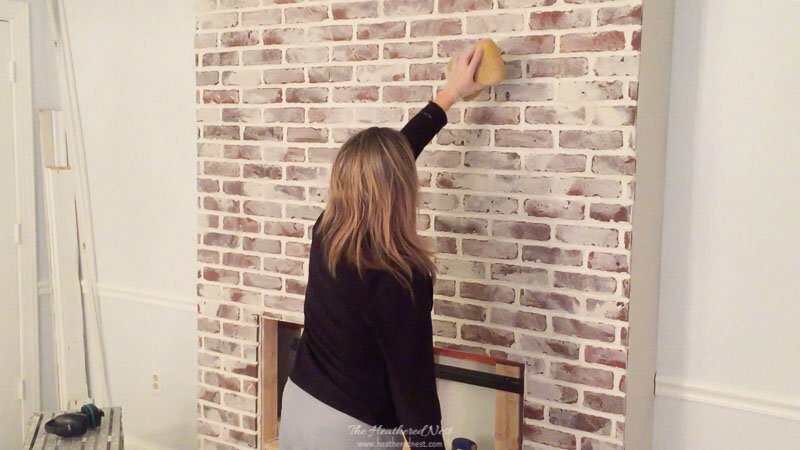 Before the mortar dries, OR, if it’s too late, then AFTER the mortar is already dried, go back over the area with your bristle brush and knock down any areas where there are clumps or places where you don’t like how the mortar is setting. And the bottom line? I was sh$%ing bricks before I started this process. DEFINITELY apprehensive that I wouldn’t like the after as much as the before. THIS LOOK IS NOT for everyone, but personally, I LOVE the charm and personality and depth/texture/what-have-you it added to this space. So if you dig it too, don’t be too nervous to try it. 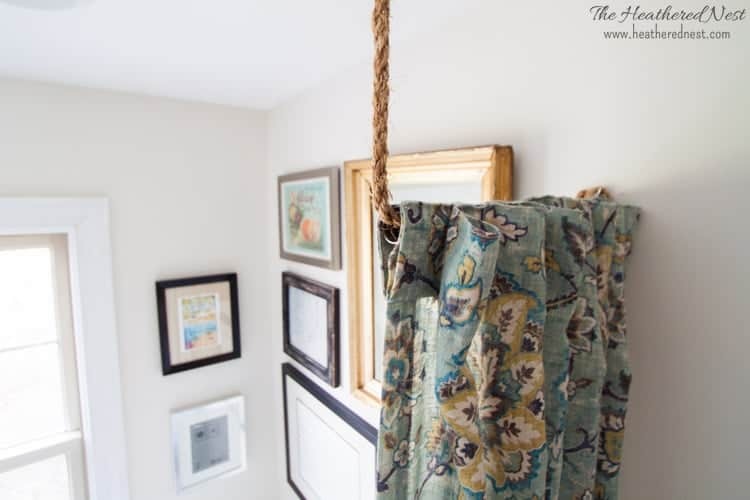 It was SUPER inexpensive to do…less than $20 (given you already have a brick wall to try it on). And being a little scared is good for us once in a while. Helps us grow, right? If you try this project, we’d LOVE to see your results! Add a photo to the Pinterest pin and your comments on how the project went! Can you do German Smear on adobe? Hi there! I guess I should say I’m not sure, since I’ve never attempted that. I can’t imagine it wouldn’t work, but I also don’t know how it would look on adobe since it’s reserved more as a technique traditionally done on brick.